Satellite imagery reportedly revealing a ballistic missile facility deep in the Saudi desert spotlights Riyadh’s increased investment in its independent warfighting capabilities, U.S. defense experts say. This, they believe, indicates a growing desire by the longtime ally to be able to take offensive measures without the approval of its main weapons sponsors in Washington. Images analyzed by missile defense experts at the Middlebury Institute of International Studies in Monterey, California, and first reported by The Washington Post, appear to show the testing and possible manufacturing of ballistic missiles. These can carry nuclear warheads to targets thousands of miles from their launch point. International powers have sanctioned Iran for its own frequent testing of the weapons. In this Nov. 13, 2018 satellite image from Planet Labs Inc that has been annotated by experts at the Middlebury Institute of International Studies, a suspected Saudi ballistic missile base and test facility is seen outside of the town of al-Dawadmi, Saudi Arabia. As America’s top weapons buyer and foremost security partner in the Arab world, one might question why Riyadh would need to invest in its own ballistic missile facility. It already has a fleet of top-of-the-line F-15 fighter jets, Tornados and Typhoons, giving it an airpower advantage over regional arch-rival Iran, the majority of whose air force hasn’t been updated since the 1970s. The catch is that Saudi Arabia’s air force still needs maintenance and logistics support from the jets’ countries of origin — the U.S. and the U.K. — and that support could be terminated if the aircraft is used in an unapproved manner. Homegrown missiles, meanwhile, have no such limit. Furthermore, missiles don’t need pilots who require training and risk being shot down and captured by the enemy. Riyadh has long operated its missile program outside the realm of U.S. approval and without U.S. assistance, starting with its small purchase of Chinese D3-F Silkworm ballistic missiles in 1988. The program is overseen by the kingdom’s secretive Strategic Rocket Forces (SRF), which unlike other military branches, reportedly do not mix with American advisors. 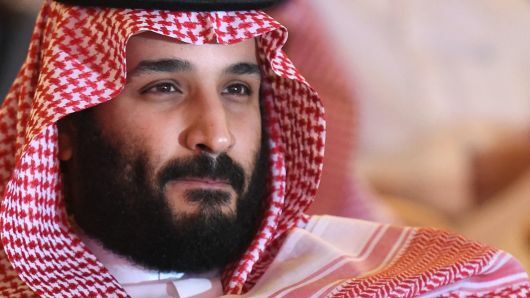 If true, the links illustrate a longtime Saudi strategy of diversifying its diplomatic and security alliances and highlight a potential shift eastward. Weapons purchases from China, though a tiny fraction of those from the U.S., now feature armed drones — something the U.S. currently won’t sell to the Saudis. And American arms dealers have voiced alarm over Riyadh’s expressed interest in purchasing Russia’s flagship S-400 missile defense system, a cheaper alternative to the U.S.-made THAAD system. China’s Ministry of Defense, its foreign ministry and embassy in Riyadh did not immediately respond when asked for comment by CNBC. Chinese Foreign Ministry spokeswoman Hua Chunying responded to the Associated Press last week, saying: “I have never heard of such a thing as China helping Saudi Arabia to build a missile base.” Pakistan’s Ministry of Defense, its foreign ministry and its Saudi embassy also did not immediately respond when contacted by CNBC. And at a time when Iran, which the U.S. and Saudi Arabia designate the world’s top state sponsor of terror, has increasingly sophisticated ballistic missile capability thanks to Russia, the investment is “common sense,” some experts say. “If the Saudis are developing an indigenous ballistic missile capacity, part of the blame for this should be placed on the JCPOA (Joint Comprehensive Plan of Action) with Iran,” David DesRoches, an associate professor of security studies at the National Defense University in Washington D.C., told CNBC, referencing the multilateral 2015 deal that lifted sanctions on Iran in exchange for limits to its nuclear program. The kingdom has long asserted its right to self defense, particularly at a time when it’s been subject to missile and other projectile fire from Houthi rebels in neighboring Yemen, where it’s led a bloody offensive since 2015. Weapons experts have confirmed that the missiles fired at Riyadh, Medina and other cities from Yemen in recent years are of Iranian origin. In an interview with CNBC’s Hadley Gamble in Riyadh on Monday, Saudi Energy Minister Khalid al-Falih refrained from acknowledging the missile base, but argued that his country should be able to defend itself. An Iranian military truck carries surface-to-air missiles past a portrait of Iran’s Supreme Leader Ayatollah Ali Khamenei during a parade on the occasion of the country’s annual army day on April 18, 2018, in Tehran. Foreign policy analysts note that this development could further complicate relations between the U.S. and the Saudis, given the already increased anger of many lawmakers over Riyadh’s activities in Yemen and the murder of Saudi journalist Jamal Khashoggi last fall, which has been blamed on Saudi government operatives. But they also warn that any sanctions would likely accelerate the kingdom’s shift eastward. One of the many former U.S. government officials wary of Saudi intentions is Bruce Riedel, a 30-year CIA veteran and expert on Gulf affairs. Could Washington be underestimating Saudi capabilities? The AEI’s Rubin believes so.